Hafal’s National Learning Centre specialises in high-quality, cost-effective, accredited and bespoke training programmes for Hafal staff, volunteers and clients, and the public, private and voluntary sectors. We also offer placements for health and social care students and deliver training at universities and colleges in Wales. 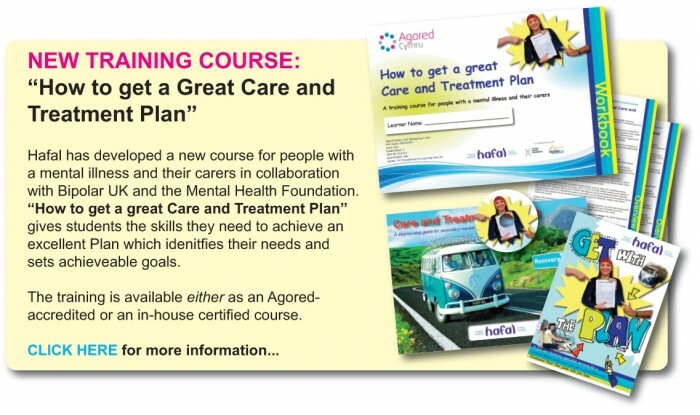 Hafal staff/volunteers: To access Hafal’s online courses log into Hafal’s staff website and click on “Hafal’s online training courses”. All Hafal’s training is based on our unique Recovery Programme which is based on the insights and experiences of hundreds of Hafal’s clients. Follow the link to find out more. Click here to find out more about Hafal’s Recovery Programme.